INDUSTRY.co.id - British Royal Wedding, Prince Harry and Meghan Markle will officially become husband and wife and legitimately become a member of the British empire. The day before her marriage, Meghan attended a tea ceremony with Queen Elizabeth, after which Meghan headed for the hotel as her place to stay. Launched from People, Meghan Markle with his mother, Doria Ragland, arrived at the Cliveden House Hotel. When he got out of the car, Meghan was smiling. He and the mother then waved to the media that perpetuate the moment. Meghan looks elegant and elegant in her navy-colored gown by designer Roland Mouret who she wore. His appearance is complemented by gray suede heels from Manolo Blahnik. While Doria Ragland wearing a cream-colored dress which is then coated with black cardigan and heels the same as the daughter worn but darker. Some people are already waiting for Meghan's arrival at Cliveden House Hotel. On the occasion, Meghan confessed 'being wonderful', a few hours before her wedding that got this royal wedding label. The Cliveden House Hotel manager welcomes Meghan and the mother. 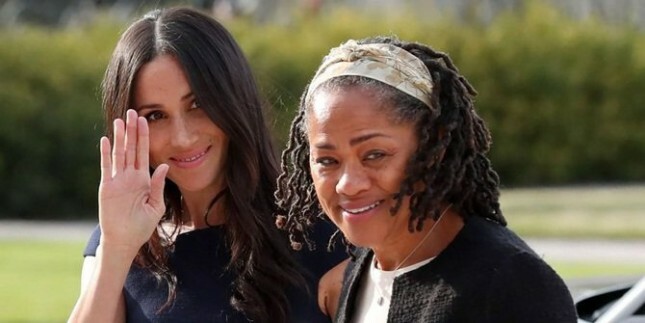 Later Meghan Markle and Doria Ragland will head to the wedding blessing, Windsor Castle, from the Cliveden House Hotel.